Published: Nov. 25, 2018 at 02:10 p.m.
Philadelphia Eagles running back Corey Clement rushes up the middle for a 32-yard gain. Published: Oct. 11, 2018 at 09:06 p.m. 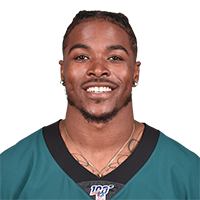 In a Week 6 game against the New York Giants, Philadelphia Eagles running back Corey Clement breaks past the goal line for his first touchdown of the 2018 NFL season. Published: Sept. 16, 2018 at 02:21 p.m.
Philadelphia Eagles running back Corey Clement bursts through the defense for a 15-yard touchdown run. Published: Feb. 4, 2018 at 11:23 p.m.